In 2008, the pescatarian restaurant Fleur de Sel teamed up with the crepe restaurant L’Argöat, the latter moving out of its upper floor space on rue Laval and into Fleur de Sel’s red brick a few doors away. The resulting merger then became known as (ta da!!) Fleur de Sel et L’Argöat, complete with a married menu as long-winded as its blended name. But the union does mean that if you aren’t in the mood for a millet pie or smoked salmon mousse, you can have a crepe for lunch. Which is nice, because it’s rare. 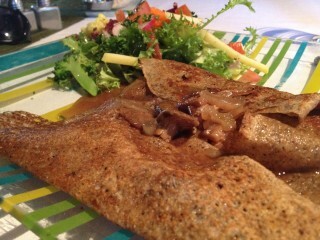 And you can have that crepe stuffed with meat, which is also rare in a vegetarian-with-fish-privileges restaurant. These are galettes, actually, the Brittany crepes made with the heartier buckwheat flour. They have a tangy, nutty sort of flavour, and the oomph to stand up to strong, savoury fillings. Fleur de Sel’s are buttery and crispy edged. The galette I chose — after being told I couldn’t have the “La Bretonne” as they were out of lardons (quelle catastrophe!) — was filled with tender strips of rare venison along with sautéed mushrooms in a gamey, woodsy jus sweetened with long, slow- cooked onions. It came with a nice little salade composée with a few pickled vegetables and a tarragon vinaigrette, and made for a happy, filling lunch. Fleur de Sel, 59, rue Laval, 819-772-8596, www.fleurdesel.ca.